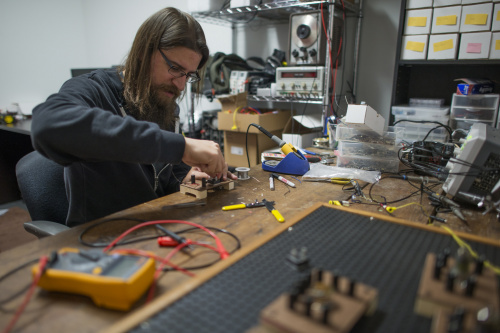 p>You know you are a maker when ________________________. Hopefully, this small sampling brings a bit of humor to your Week of Making -- we definitely had fun putting it together! If you have something you would like to ask the SparkFun team, leave us a comment; we'll be doing these types of posts from time to time. p>...family members fear you'll "burn the house down," even though there was only that one time. p>...you get stopped by TSA every time you fly because you forgot your work-in-progress was in your backpack. p>...you catch yourself hoarding the parts of an old Sleep Number mattress "in case I need to use them for something." p>...you solder as a stress reliever on the weekends. p>...you can recall the pinouts for dozens of IC's, but can't remember to buy butter. p>...you drive out of your way to see what's in the dumpster behind the local tech company. p>...when your family members first response to "Look what I made" is to protect their vital organs. p>...there's no room for meals on your dining-room table. p>...you spend three hours automating a process would have taken 40 minutes to do manually. p>...you're not sure whether it's 2 p.m. or 2 a.m.
p>...when you find knitting needles in your toolbox or a rivet setter in your makeup bag. p>...something cool and new hits the market, and you have to buy two -- one to play with, and one to tear down. p>...you list Philip Brainard's kitchen in Flubber as a life goal. p>...you'd rather spend hundreds of dollars to custom build something you can buy for $20 at Target. p>...your project works but you don't know how or why. p>...you've accumulated enough junk parts to build your own super computer from scratch. p>...you know making a project is 2/3 taking apart, 1/4 putting together, and the remainder glaring at it. p>You know you're a maker when ________________________. Friends and family bring you stuff that doesn't work... and when they get it back it does things it didn't when they bought it. TOTALLY got hit by the TSA! ...you buy things exclusively for the parts inside. ...you spend forever tracking down a specific revision of a device because it's easier to hack. ...you learn how to sew just so you can know when you've finished fixing an industrial sewing machine. ... no room for meals on the dining room table, OR the kitchen counters! ... you have a soldering station and good parts supply under your "significant other's" bed "just in case you need them". ... your on-line ads are from Digi-Key, Arrow, and Element 14. ... your girlfriend asks what you want for your birthday, and you respond with "Adafruit's 10-color assortments of stranded and solid hookup wire" and then hope that it'll last to Christmas. ... you're disappointed when a gift says (only) some assembly required. ... you keep coming up with more responses to this question. ... you use the closest (of many) wire cutters to trim your fingernails or toenails. ... you make nearly half the replies to your own posts on Sparkfun's blog. You are the first person everyone comes to when looking for that one weird screwdriver tip. The local news checks with you first when someone reports an UFO. The local emergency services drive by regularly 'just to see what you are up to'. â¦ you have a wider variety of tapes and adhesives than Home Depot. ... you know youâre the one person whoâs prepared for a zombie apocalypse. You like a challenge. â¦ you love the smell of 3-in-1 and aluminum oxide in the morning. â¦ you know to always leave a note in your luggage, for security, identifying âstrangeâ looking items. â¦ you just canât decide which physics principles to challenge/employ in your next weekend project. â¦ during the development of one project, you realize 10 more great project ideas. â¦ you keep a few containers of your own extra parts collection at work in case âtheyâ need anything. â¦ the ruby in the first ring you gave your wife is from a laser optics mount you found in the physics department dumpster, and she loves that fact. â¦ you know that a gift you make yourself is the only kind truly from the heart. â¦ you are serious about your silly putty. ... you come to think of Sparkfun, not as a supplier but, as a social network. -- You often receive gifts of broken electronics, because "they thought of you." Disagree. I have...requisitioned...plenty of tongue depressors, q-tips and cotton balls that ended up being used for things other than their intended purpose. My dentist gave me an entire container of that stuff they use to take molds of your teeth for crowns. I 3D printed him a mandible as a thank-you gift. How do you keep it so uncluttered? I know from your blogs that you're not one of those people who maintain tidiness by never DOING anything. A one pound spool of solder is one of your monthly "Subscribe and Save" items. ...you can never ask for help at the hardware store because nothing you buy there is ever used for its originally intended purpose. You actually get a fire extinguisher from your kid on Father's Day! I mean WTH...It probably is for the best though. There HAVE been issues. Or from your roommate or wife, with a request of "Please do use this,.. next time". SparkFun Live 7/8/2014 - Nate and Pete "Ask Me Anything"